Today, HootSuite adds three new analytics modules to the ever growing suite of measurement tools designed to gauge ROI, provide actionable data and help evaluate social media activities. Introducing HootSuite Message Tagging for Enterprise, an optimization tool that allows you to group your messages, helping your organization gain valuable insight on your social campaign’s performance. Plus we have added new retweet summaries for premium plans (All Links Module) and enhanced Ow.ly reports for all users (Daily Retweets Module). 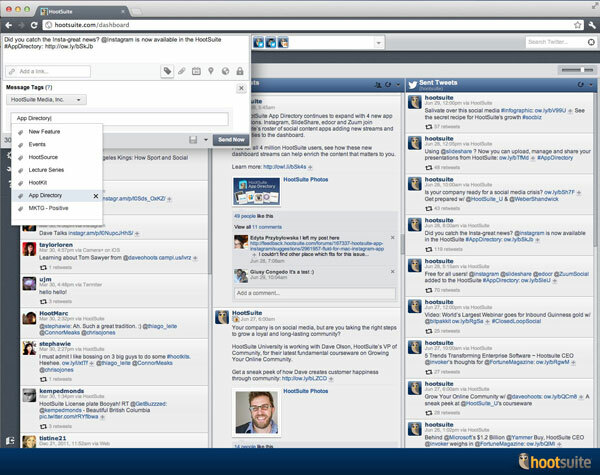 Mark outgoing and instream messages with custom tags using HootSuite Message Tagging. View all Ow.ly links between a chosen period of time using the new Owly Analytics Modules. View a retweet summary with specific retweet details for a given Twitter handle and date range as well as the Top 10 retweets with the Daily Retweets module. Mark an outgoing message with a custom tag to monitor the feedback of a campaign, content type and event. View the aggregated post counts for internal tags. 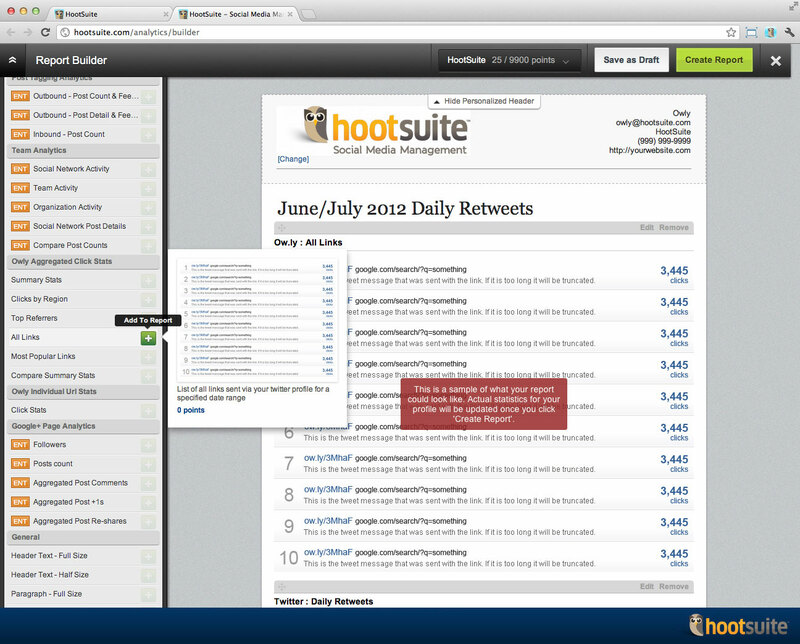 Step 1: To start your HootSuite Message Tagging campaign, open up your Compose Box and click on the Tag Icon. From here a pop down menu will appear. Step 2: Type in the name of the tag you would like on this message and click “Create Tag”. This tag will then be saved and ready to view at a later date. To view tagged campaigns, click on Analytics in the side-menu, access Report Builder and add Post Tagging Analytics to your Custom Report. Note: All tags will be associated to an organization and can be viewed/edited by any member of the organization. Adding Post Tagging Analytics to your customizable reports, give a comprehensive picture of your organization’s participation in social spheres. Under Owly Aggregated Click Stats and located between the Top Referrers and Most Popular Links modules, the All Links module gives access to a list of all Ow.ly links sent for a specified date range. This module is free and available to all users. Step 1: To create a report, click the Analytics button from the sidebar. From here click ‘Create Report’ and select which template you would like to use. Step 2: Once a template is selected, you can add Analytics Modules by selecting them from the left sidebar of the Report Builder. 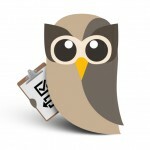 To access the new Owly module, click on the tab All Links found in the Owly Aggregated Click Stats section. 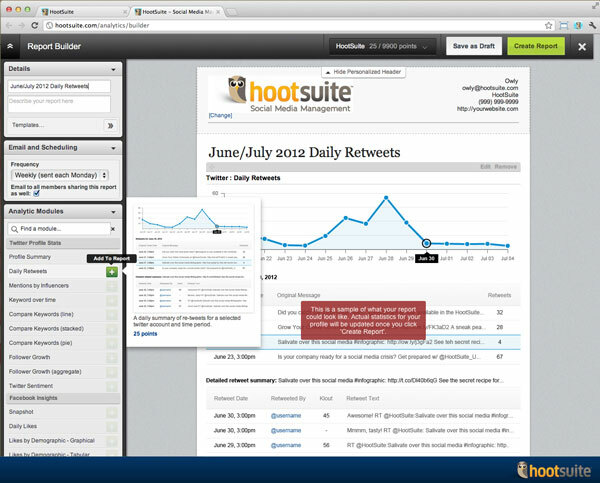 The Retweet Analytics module will add a dynamic and interactive approach to reporting. All users will now be able to view a daily summary and/or a selected time frame of your re-tweets for a specified Twitter handle and date range. With each summary, you can now see the associated details for each selected tweet. Plus, view the Top 10 retweets for a given Twitter account and date range. Step 1: To access the retweet module, follow the above steps to create a report. Step 2: Once you have created a report, add the retweet module by selecting Daily Retweets (found under the the Twitter Profile Stats tab) from the left sidebar of the Report Builder. HootSuite continues to expand our analytics to provide you with a powerful set of measurement tools. 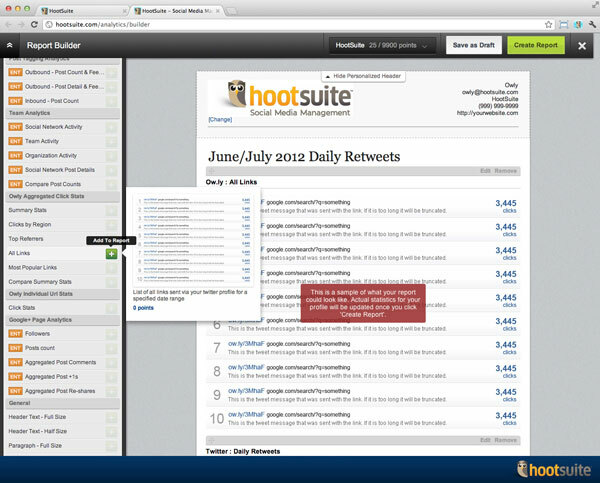 Designed to give a comprehensive evaluation across a variety of social media activities, HootSuite analytics now includes HootSuite Message Tagging, Daily Retweets summaries as well as the new All Links module. 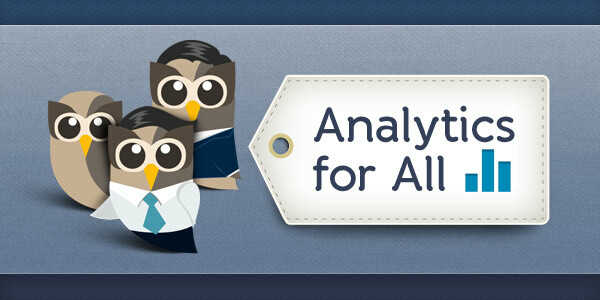 As the suite of measurement tools grows, keep in the know by following @HootSuite on Twitter to find out about further integrations and developments.